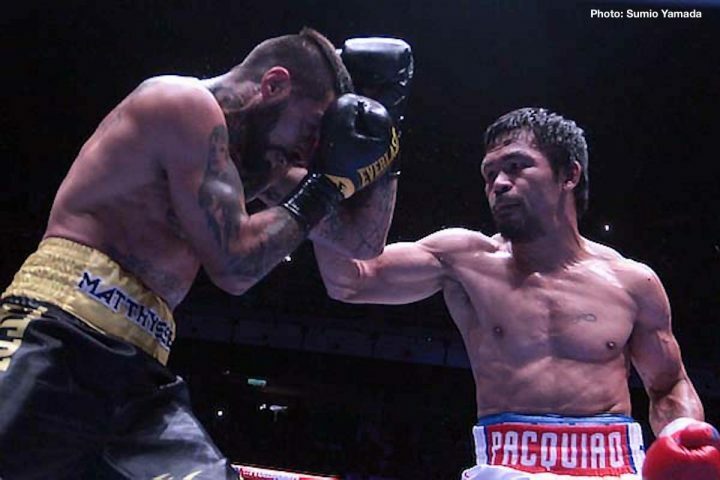 By Chris Williams: ESPN analyst Teddy Atlas wasn’t all that impressed with Manny Pacquiao’s victory over WBA welterweight champion Lucas Matthysse last Saturday night. Atlas saw the fight as Pacquiao (60-7-3, 39 KOs) fighting a heavy bag with arms at the Axiata Arena in Kuala Lumpur, Malaysia. Pacquiao knocked out Matthysse (39-5, 36 KOs) in the 7th round in their fight on ESPN+. The fight wasn’t publicized well, as many boxing fan didn’t even know Pacquiao was fighting until reading about it on Sunday. Atlas points out that Matthysse looked like he wasn’t even trying to fight. He was just taking shots, and appearing like he wanted to quit by round 5. Atlas states that Pacquiao would look his age of 39-years-old if he were fighting the elite welterweights Errol Spence Jr., Keith Thurman and Terence Crawford. Pacquiao couldn’t count on those fighters taking blows the way Matthysse was without firing back shots in return. Of course, Pacquiao wisely didn’t attempt to face any of those guys. Rather than going for those three fighters, Pacquiao hand-picked the 35-year-old Matthysse. “If you have a heavy bag, you look good,” Teddy Atlas said to ESPN about Pacquiao’s victory over Matthysse. ”All you Pac maniac fans out there, no disrespect. Give him a lot of credit; he’s 39-years-old. He got the job done. He looked good against a 36-year-old, who in the end, he quit; a diminished Matthysse. He did not fight. He did not try. In very little spots, he threw. For the most part, he was a passive guy, who looked like he was just getting paid,” Atlas said. Atlas is 100 percent dead on about Matthysse. Pacquiao had a guy in front of him who had no business holding a world title belt in Matthysse. Pacquiao made it look easy defeating Matthysse. Pacquiao is a legend in boxing, but he’s no longer facing the best in the welterweight division since his loss to Floyd Mayweather Jr. in 2015. Since Pacquiao’s defeat at the hands of Mayweather, he’s fought Tim Bradley, Jessie Vargas, Jeff Horn and Matthysse. Those are all B-level fighters at 147. Bradley was an A-level guy during his prime, but he was finished by the time Pacquiao fought him the third time in 2016. ”You can’t knock him. The only thing you can say if you’re going to X-ray the fight and look at Matthysse, is a fighter that is 36-years-old with 45 fights,” Atlas said. ”At the end, he [Matthysse] took a knee. He looked like he quit. He looked like he was trying to quit in the 5th round when he got hit with a punch that barely touched him. It might have been up top around the temple, which can be a spot. It can be a delayed knockdown. He took a knee. It looked like he was thinking of not continuing at that point. Two rounds later, he gets hit again, a good uppercut just like he did in the third round. He gets dropped with that punch. The right hand blinded him a little bit. That punch looked like it didn’t even land. It didn’t look like a consequential punch obviously, but he decides to take a knee. He was thinking about quitting. He was thinking, ‘Do I continue? Alright, I’ll continue.’ Then of course he gets convinced not to continue with that good solid uppercut in the 7th,” Atlas said. prime Pacquiao. Matthysse wanted no part of standing his ground and fighting Pacquiao in the pocket last night, which is a shame. The Argentinian fighter came into the contest with 44 fights. He should have been willing to stand and fight. Atlas obviously makes Matthysse sound really bad, but you can’t blame him. The entire world saw how bad Matthysse looked in that fight. It’s hard to give Pacquiao much credit for beating Matthysse because he was facing a guy that quit two years ago against Viktor Postol, who beat him just as bad as Manny did. The shots that Pacquiao was hitting Matthysse with were single punches that looked badly telegraphed. They weren’t thrown with blinding hand speed. Pacquiao looked slow in comparison to the form that he had showed 10 years ago in stopping Oscar De La Hoya in the 8th round. Matthysse was so wide open on defense that he allowed 5’6 ½” Pacquiao to hit him with everything he threw. Matthysse looked embarrassingly bad, and totally unlike a world champion. He looked like a shot fighter. “Again, a marvelous performance by a 39-year-old with 69 fights,” Atlas said about Matthysse. “No doubt about it, but no effort from the other side. No resistance on the other side. If you can fight guys like that all the time, he might be able to fight until he’s 79,” Atlas said of Pacquiao. Yes, if Pacquiao is going to carefully select fighters that give him no resistance like we saw from Matthysse, he can definitely stick around and succeed for a number of more years. Manny can hide his deteriorating boxing skills by facing guys that aren’t even trying to win. It won’t be that way if Pacquiao fights the young lions a 147 like Errol Spence Jr., Terence Crawford, Shawn Porter, Danny Garcia and Keith Thurman. Some boxing fans think Pacquiao isn’t seriously looking to face the best at this stage in his career. They think he’s only trying to make money to pay off his outstanding bills. If that’s the case, then it’s probably safe to say that we’re not going to see Pacquiao fight any of the lions in the welterweight division. He’ll continue to play it safe by spotting easy marks like Matthysse and Amir Khan, and go after them rather than risking his hide against Spence, Crawford, Porter, Garcia or Thurman. “Don’t lie to yourself. I’m not going to forget that he’s had 69 fights and he’s 39-years-old, and he fought a guy that had Everlast printed on his forehead,” Atlas said about Matthysse. “I’m not going to lie to myself. If I get in there with those young bulls that are in the welterweight division…the welterweight division is as loaded as any division. You’re talking about Thurman, Crawford and Spence. I would be very, very careful, even after that nice performance. Remember who it was against. Remember what it was against. Don’t lie to yourself. You start getting in there with the difficult pool that I just described; these young tigers, these young bulls. Well, guess what? You might see Pacquiao looking 40-years-old,” Atlas said. I don’t think Pacquiao has any real intention of facing the young tigers in the welterweight division. If he did, he would have fought them a long time ago instead of Vargas, Bradley, Horn and Matthysse. Pacquiao seems to be just looking for easy payday fights rather than going for the fighters that would be high risk opponents. You can argue that’s why Pacquiao’s popularity has plummeted and he’s fighting on ESPN+ instead of HBO PPV. When all you’re willing to do is fight the likes of Matthysse, Horn, Vargas and Bradley, you’re not going to have boxing fans eager to pay to see your fights.